Our pay-for-view job posting platform offers all employers total flexibility with their online hiring advertising. Regardless of the number of security cleared positions your company has, all will appear on ClearanceJobs.com and our wide network of targeted affiliate sites. Set a Budget. Job views from the largest network of cleared, career-minded professionals available anywhere are incredibly cost-efficient. Set your monthly or daily spend limit and change it at any time. With set budget limits, there's no chance of "over paying" when your jobs are popular. Post Your Jobs. Post as many jobs as you have that require clearance - unlimited. The more jobs you post, the wider your reach into our cleared community. Our new, fully automated batch job posting system makes adding, deleting, and editing jobs a hands-free process. Collect Candidates. Your jobs are pushed automatically to relevant candidates, and seen in the ClearanceJobs searchable collection. Full, detailed reporting shows who viewed your job and when. Whenever possible, a link to that candidate's resume is provided. No more wondering whether or not your job views are from actual candidates or not: our unique codebase filters out all known web spiders, so you can be confident that views to your jobs are coming from humans, not computers. Unlimited access to complete campaign details, all at-a-glance in real time. You'll see every view for every job. If the view comes from a logged-in ClearanceJobs candidate, you'll have a direct link back to their profile and contact information. Plus, all job view data can be exported to Excel for further analysis, or saved as a Word or PDF file. Get alerts when your job views hit predetermined thresholds. Decide who gets alerted when your job views budget hits 50%, 75% and/or 100% of capacity. 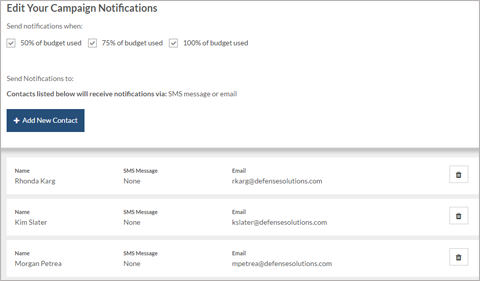 Select from email alerts or SMS text alerts. You'll know immediately when your ad campaign hits its limits. STG, Inc. in Reston, VA had 15 contracted job slots, but 135 open slots on their website. The Hinkle Group in Chantilly, VA had 5 contracted job slots, but 70 open slots on their website. All Native Systems in Bellevue, NE and Credence Solutions in Herndon, VA started Pay-Per-View trials. Let the ClearanceJobs account team work with you for a solution customized to your hiring goals and budget. Our product team will ensure we get your job postings, regardless of the source. Take advantage of ClearanceJobs Pay-for-View Job Postings - contact us today.